My daughter decided she was going to paint some of my empty jars. Of course her brothers had a great time joining in. 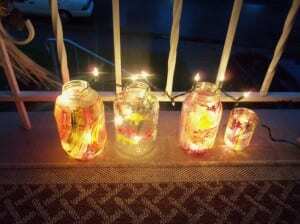 The wonderful thing is, they ended up being beautiful homemade holiday jars. We ended up with some wonderful jars. So the next choice was where to put them. We ended up putting them outside and stringing white Christmas lights in and out of them. They really lit up the outside and got us in the mood for carved pumpkins and Thanksgiving decorations. The great thing is, you can make these jars and use them in many different seasons. The choices are endless; you can choose Autumn, Halloween, Christmas colors, or even Valentine’s day. Any paint will work, though some may wash off if they are out in the rain. I would put a strip of duct tape over the top of the jars to keep the rain out if you place them out in the yard.